Revelation is a complex book. It can at times seem unapproachable and it certainly takes a fair bit of imagination to engage with it. It also requires that we decode the symbolism, but once we do, the veil begins to be withdrawn. In the first chapter we join John in the spirit, meeting the resurrected Christ in the clouds. Let’s look at how Albrecht Dürer envisioned this. He draws John as a young man, despite his – at the time – old age. Perhaps Dürer is following tradition in portraying him as the beloved disciple or is he perhaps depicting him in a spiritual state? John is not prostrate as the text implies. That would lock him in a frame early in the timeline of the text (see Revelation 1). The artist portrays him at the most important point: when he receives the messages to the early urban churches, at a point where he has been told to not be afraid. Christ’s feet are like bronze: he comes tested and victoriously from the ultimate furnace. His hair is like lamb’s wool and snow: he appears in complete purity. His eyes are like fire: his gaze is penetrating and purifying. He has an overwhelming voice: like oceans, rivers or waterfalls. His word is like a close combat weapon: sharp and discerning, separating wrong from right. His face is shining like the midday sun: not just illuminating our walk but making us lights for the world to see. How is this Christ different from the one we know from the gospels? Why does John take his time to describe him in such colourful detail? This is because here he portrays Christ as the founder of the universe holding the keys to life and death, as the one who is sitting in the highest seat, the only position that can provide actual, eternal justice. This may have an emotional impact on us too, as it means that all evil will be dealt with. This in turn means that we don’t have to waste energy on the evaluation and judgment of others. We can focus on forgiveness. We are not only liberated from a tremendous burden that messes up our social life, but we are also better equipped to do good. Dürer draws Jesus with his kingly belt not around his chest, ready to rest, but around his waist, ready for action. He is surrounded by the lampstands, not elevated above his churches but right amongst them. He sees what troubles them and speaks to them through their guardian angels, exposing the churches, giving them his warning and speaking words of encouragement. Notice how one candle at the left is flickering, about to be extinguished. Since John oversaw more than seven churches in Asia Minor, the number seven suggests all churches, symbolizing completeness. A glance at the messages to the congregations reveals nothing that most churches haven’t been struggling with. They are suffering, they are under increasing pressure and worldly influence, yet they are also shining. Albrecht Dürer sought the help of others to be able to acquire all the equipment he needed for his Revelation project. He was what we today would call a project manager, designer, artist, craftsman and printer all at the same time. The series is recognized worldwide as a masterpiece and has been called “one of the greatest monuments of Reformation art” by Hans Rookmaaker. 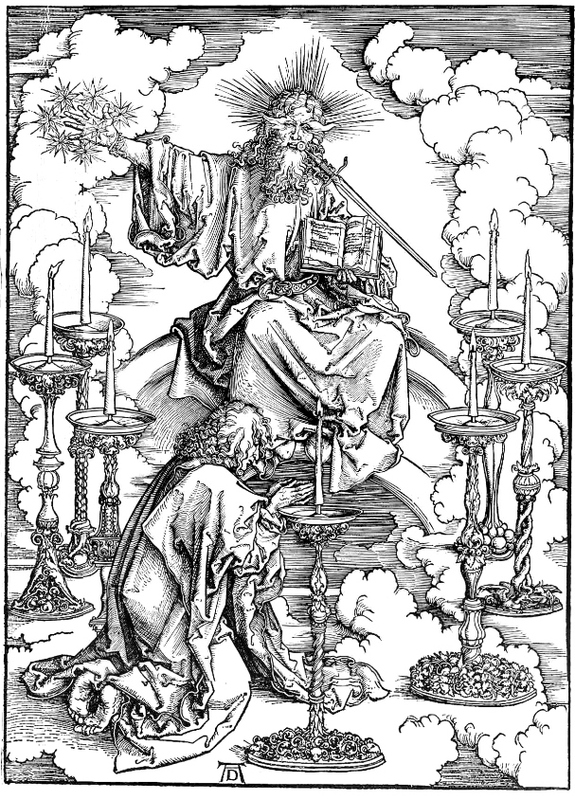 Dürer printed the biblical text on the back of his illustrations, so that text and image could inform each other, engaging various faculties of the mind. Dürer’s woodcuts help us to us imagine Christ in his elevated state, as we read his short but potent messages to the churches. The warnings are not from a distant and detached God, but from Christ sitting right amongst his churches. Suggestion for Bible Study Groups: Read aloud through Revelation while following along with photocopies of Dürer’s woodcuts of The Apocalypse as an instructive and helpful way of experiencing the structure of this most complex and pictorial of biblical books. It takes about 1 hour and 20 minutes to read through the entire text. ‘Blessed is the one who reads aloud the words of the prophecy, and blessed are those who hear and who keep what is written in it; for the time is near’ (Revelation 1:3). Albrecht Dürer, St John's Vision of the Seven Candlesticks, c. 1498, woodcut, possibly pear wood, 39,5 x 28,5 cm. Albrecht Dürer (1471-1528) was born of a Hungarian high-level goldsmith immigrant to Nuremberg, who trained him as a goldsmith. Dürer traveled to both Italy and the Netherlands to learn and share new techniques regarding both painting and printmaking. He is a master equal to the High Renaissance Italian master painters. His reputation as one of the greatest European artists ever has never been challenged. Per-Ole Lind is a worker at the Swiss L’Abri alongside his wife Amelia and their two children, where he is currently working through the book of Revelation. Per-Ole is a practicing artist, with background as an Art Director for clients such as The Danish Embassy in Tokyo, Shu Uemura, Mazda, and Copenhagen Airport.